No hatches to speak of-a couple stones, bwos, and caddis,but not nearly enough to get any fish looking up. Posts: 319 I have been blessed lately with a lot of time to get out on the water lately, and as such I'm kind of clogging up the fishing report board on here-sorry about that. In any case I got to spend two beautiful days on what is, in my opinion, the most beautiful stream in the Ozarks. 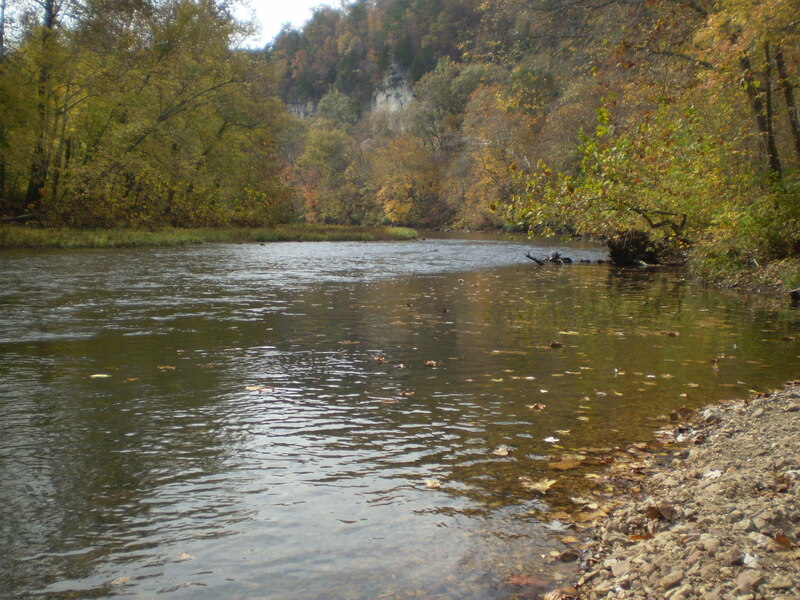 By Missouri standards, it's a very large trout stream, flowing at an average of about 700-800 CFS. It's a National Wild and Scenic River, with no development whatsoever along the river. Along much of the length of the river I floated, one bank is a wilderness area and the other is run of the mill Forest Service property. The river is also very remote, and doesn't see a lot of pressure, even though everyone knows it's a good stream. It's a stunningly beautiful, bluff lined woodland river. It's heavily spring-fed like all Ozark trout streams, but it looks more like a western freestoner. And instead of the normal scud/mayfly/caddis food base you'd normally see around here, it's primarily a stonefly river. The drill is, pretty much 365 days a year, you fish a big golden stonefly nymph down as close to the bottom as possible. It's not the most graceful way to fish, but it just seems to be the only thing that gets it done on this river with any consistency. So that's what I did. Right below the put-in is a long, glassy pool. It doesn't look like good trout water (too stagnant) but it is. I drifted the stonefly along the likely banks and caught my first fish right away-a stunning 15" wild rainbow. I caught a couple more fish from that pool before making it down to the first rapid, or "shoal" as they are called down there, and got out of the boat to wade. It was a fast run braided around an island. One channel is altogether to shallow and fast moving to be of interest, but the other has a great little cushion on the inside bend, and I took a couple of fish there. So that's how it went. I fished the pools from the boat, picking up a fish here and there, but the best fishing was always wading in the rapids. The Eleven Point is one of the few Ozark streams with true brawling pocket water, and the rainbows love those areas. If you can get you're fly down to them, they're pretty opportunistic, as they don't exactly have a lot of time to reject a fly. Finally I set up camp on a gravel bar, grilled some brats and hit the sack. When I woke up the next morning, the temp was in 30s and it was downright cold. A little fire was plenty to warm me up nicely though. By this time, I was in the "White Ribbon" stretch of the river that is stocked monthly by the state and under statewide regs. So I hope you all will forgive me when I say that I went to the deep pool in front of the gravel bar and quickly caught a 10" rainbow for breakfast. I can't remember the last time I kept a trout, but I will say, under the circumstance I didn't feel too guilty about it. On Sunday, the fishing was a little different. By now, I was getting pretty far downstream, and I started catching some nice smallmouth bass in the deep holes. They were more than happy to take the same stonefly that I was catching the trout on, and I really enjoyed them. The rapids still held plenty of trout, and I really enjoyed the variety of that. When I finally got to the take-out, I was upset to be leaving the river and that little chunk of the state-a mark of a nice trip.